Now that I’m a long-distance running extraordinaire (ha), I’ve been doing more runs on the treadmill to keep up my endurance. With two kids, running on the treadmill at the gym is just easier than pushing a double stroller out in the cold. But the problem with the treadmill workout is the boredom. Like a hamster on a wheel, you’re running and running and just not getting anywhere. No change in scenery, and the Kardashians on the treadmill TV can only make the mileage go by so quickly. So in an effort to spice up my treadmill workouts, I jumped at the chance to review Motion Traxx’s Cardio Stars workouts. Jenn has tried their audio workouts for cycling, but I’d never done a coached running workout before. And let me tell you: I have not been pushing myself all that hard on my treadmill workouts! I tried a 30-minute shortened version of the Treadmill Coach Vol. 2 Workout with Amy Dixon and the 60-minute full workout, and they were tough. Unlike your easy distance training runs where you don’t really worry about speed, these workouts are meant to push you, hard. 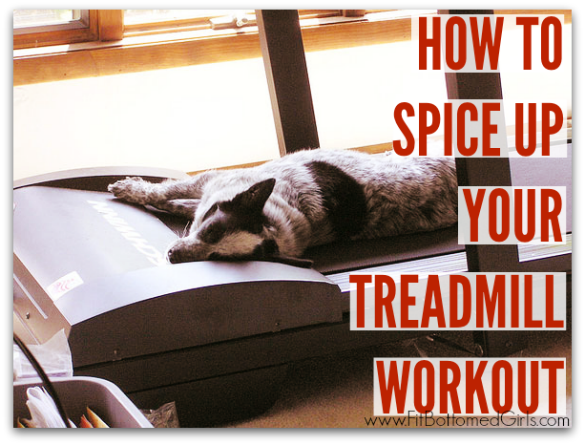 You can use the treadmill workouts whether you’re walking or running, and you adapt the speeds and incline to suit you and your fitness level. Coach Amy gives her suggested speeds and incline, and then you just try to keep up. Although the music is just okay in the background — it does do a good job of helping you pick up the pace when you need to — the coaching is great for letting you know what’s coming up, when to save some energy for later, and when you’ll get a much needed break. With most of the incline at the 6 to 12 percent range, you’ll feel like you’re running uphill the entire time, and with intervals throughout and plenty of hard speed pushes, you’ll get a really good workout. I know that I haven’t been pushing myself like that on my runs, and I certainly had better workouts. I’ll admit that during the 60-minute workout, I had to start my cool down just a touch early because I was totally spent. But that’s the beauty of it: you can do as much or as little as you like and tailor it to your needs. At $9.99 on iTunes, you get a 60-minute workout that includes five cardio stages. You could easily mix and match those stages to suit your time constraints for the day and have several different options for customized workouts. I get bored as well with the treadmill. What helps me is doing the “Fartlek” training. It is when your alternating your speed from fast to slow. I feel that makes it more exciting when being on the treadmill and it’s better for yourself.